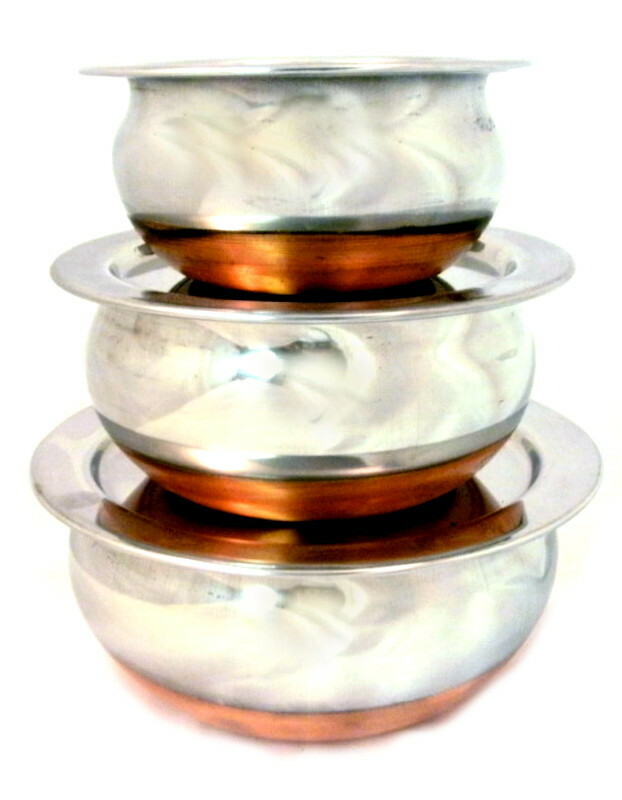 3 Piece Copper Bottom Indian Handi Pot Set with Lids | Buy Online at The Asian Cookshop. 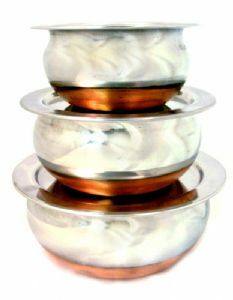 This set includes small, medium and large copper bottomed dishes. All with individual lids to cover. Copper based cookware have a stainless steel interior and a stainless steel but copper bottomed outer. The copper is a good conducter of heat naturally and so is often preferred for Indian cooking. Copper can mark and tarnish but it will not affect cooking. TIP: an old family trick passed on to us is that copper bases can be cleaned [wearing gloves] with lemon juice & salt - or try flour, salt & vineger - then rinse, this should bring back some of the shine - thanks Rupa!